To improve the quality of life for older adults by providing opportunities for exercise, congregate dining, travel, education and socializing so that members can maintain self-esteem, functional ability, and well being, enabling them to remain in their homes and communities. We believe in the value of human life, the dignity, the self-worth, the warmth of caring, sharing, giving and supporting of the older adult. We believe that human beings need peers with whom they can interact and who are available as a source of encouragement and support. We believe that adults have the right to have a voice in determining matters in which they have a vital interest. The philosophy of our Centre is based on encouraging each individual to maintain or attain. their maximum potential in terms of self-esteem, functional ability, confidence and well-being. Please come and visit us, and thank you in advance for your cooperation and respect. 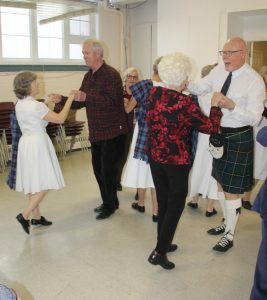 The Syme55+ Centre is a registered charity serving adults 55 years of age and older specializing in recreational activities, special interest clubs, fitness programming, daily lunches and community services. In addition the Centre offers a series of unique events and travel experiences to members. Housed in the city’s David Appleton Community Centre, Syme55+ has a permit to use the building from Monday through Friday, 8am-4pm. A monthly calendar and a quarterly newsletter are available at Reception or around the Centre. Various important notices are posted around the Centre and advertised on the electronic bulletin boards (TVs). The Centre is governed by a volunteer Board of Directors and employs staff to manage day to day activities. Other staff members are from the City of Toronto. Operating funds are from City and Provincial Grants plus revenue raised from fundraising, user fees, events and donations. Grants are 62% of our income, fundraising and donations are 22% of income and user fees are 16% of income. An Annual General Meeting is held every April and members have voting privileges.